Anyone can save the galaxy once. Obviously. In anticipation of the earthbound release of Marvel Studios’ “Guardians of the Galaxy Vol. 2” on April 26 in the Philippines, Marvel Studios has unveiled the action-adventure’s new trailer! Take a look at your favorite intergalactic misfits saving the galaxy a second time in the video here. Along with the new trailer, Marvel has also launched a new Guardians poster which may be seen below. Guardians of the Galaxy Vol. 2 is written and directed by James Gunn. 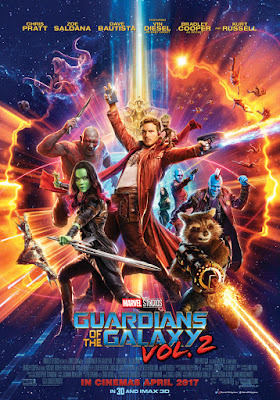 The film marks the return of the original Guardians, including Chris Pratt as Peter Quill/Star-Lord; Zoe Saldana as Gamora; Dave Bautista as Drax; Bradley Cooper as the voice of Rocket; Vin Diesel as the voice of Groot; Michael Rooker as Yondu; Karen Gillan as Nebula; and Sean Gunn as Kraglin. New cast members include Pom Klementieff, Elizabeth Debicki, Chris Sullivan and Kurt Russell. Opening across the Philippine on April 26, 2017, Marvel's “Guardians of the Galaxy Vol. 2” is distributed in the Philippines by Walt Disney Studios Philippines.